A Memorex mini DVD that had been used in a Canon Camcorder. 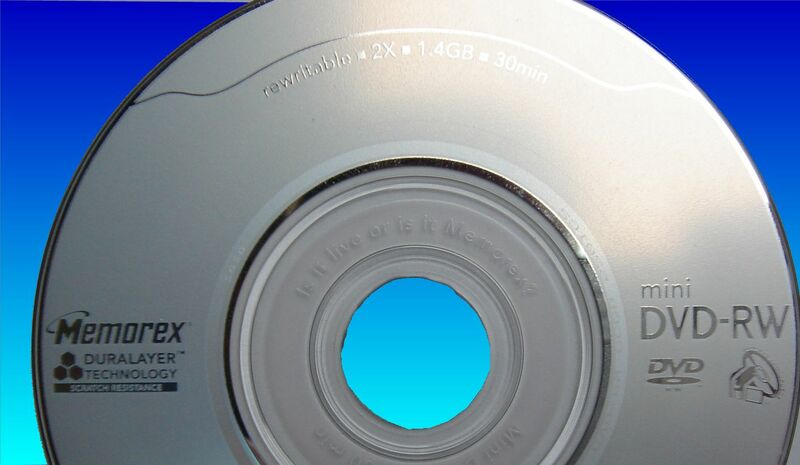 A Memorex DVD-R that had been used in a Canon DC210 camcorder. The camera displayed an error message saying Unable to Recognize the Recording Mode of the Disk. There was a problem to finalize the disc. Just wanted to let you know the data disk has arrived safely! It plays perfectly in the DVD player and now we all can see the birth of our only grandchild. Again, thank you so much for fixing this for us. Be sure I will recommend your services to anyone I come across who has data recovery problems. If you need a Canon DC210 with recording mode of disk error message service, then contact our friendly company. A Memorex DVD-R that had been used in a Canon DC210 camcorder. The camera displayed an error message saying Unable to Recognize the Recording Mode of the Disk. There was a problem to finalize the disc. Just wanted to let you know the data disk has arrived safely! It plays perfectly in the DVD player and now we all can see the birth of our only grandchild. Again, thank you so much for fixing this for us. Be sure I will recommend your services to anyone I come across who has data recovery problems..